Is the Bitcoin Millionaire Pro by the International Council for Bitcoin SCAM or Legit automated trading software? What does the Bitcoin Millionaire Pro system offer? And is it a free Cryptocurrency trading signals app which generates profits on auto pilot? The truth is that the Bitcoin Millionaire Pro trading bot is a newly-launched Crypto scam and confirmed get-rich quick scheme. These liars promise they will make you a lot of money. Bitcoin Millionaire Pro is a new Crypto trading software scam, which promises they will make you a lot of money. They claim you will make huge profits of thousands per day, however the truth shows otherwise. The people who created Bitcoin Millionaire Pro, also created the popular viral scams system such as Profit Wizard Pro, Bitcoin Code, Bitcoin Loophole, and even the Tesler App which is now back in action and successfully baiting new victims on a daily basis. So forget about super accurate signals which generate thousands of dollars, or anything which even remotely suggests you make money while you sleep. Because, as our revealing Bitcoin Millionaire Pro review will prove, the reality of it is that you are dealing with a financial scam designed to rip you off and steal your hard-earned money. Below is the main sales and registration area for the Bitcoin Millionaire Pro app. 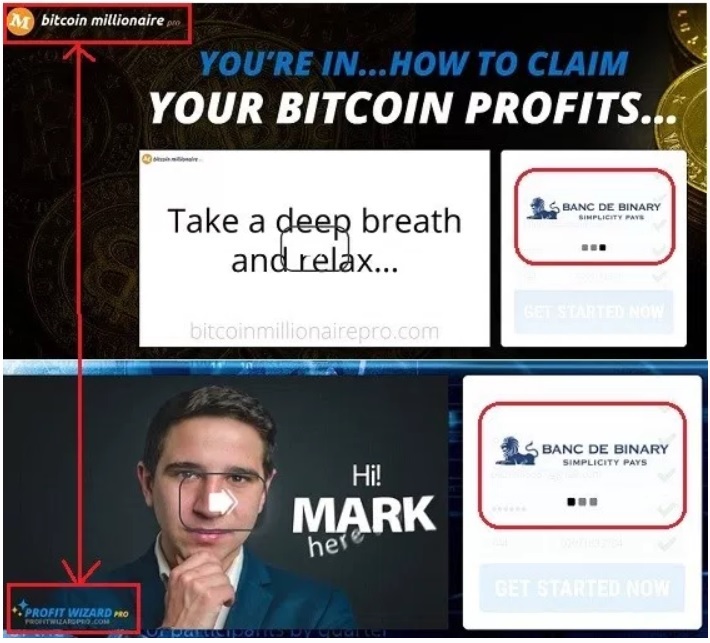 In it you can clearly see that Bitcoin Millionaire Pro is a clone of the Profit Wizard pro. In fact, the image of Banc De Binary ads an additional layer of suspicion to what is an already questionable and problematic trading niche. For those of you who don’t know or are unaware, Banc De Binary was huge Binary Options broker which was shut down due to SEC violations and various regulatory and media-related issues. It has gained massive negative exposure and for that reason was not able to keep it’s doors open and accept new clients. What is The International Council for Bitcoin? This is a non-existent entity which was designed to create a sense of legitimacy in what is obviously a crappy product. Digital currencies are quickly becoming an essential part of our lives and account for millions of daily financial transactions. People across the world are able to sell their services or various goods and in this way cryptocurrencies are actively changing the lives of many individuals. The trust in key cryptocurrencies such as Bitcoin and Ethereum also demonstrates the digital prowess these currencies have gained as time progresses. It is exactly this kind of prowess which has generated much media hype which most investment platforms such as Bitcoin Millionaire Pro are seeking to take advantage of. The hyped up claims about a highly profitable trading platforms are nonsense at best, and most likely contrived by crafty affiliate marketers looking to get their cut of the commission pie. In fact, it is also copied from the Litcoin Trader SCAM. To reiterate, the claims of zero commissions and fees when you signing up to the platform is should turn on your alarm bells. If this is true, how do the individuals behind it make their money ? The answer is simple, the promoters behind it are getting paid for referring paying customers (that’s you). Moving forward, the “company” claims to have 100% successful signals with almost no losses and guaranteed wins which will turn your minor investment into a million bucks overnight. Obviously this is a lie and impossible due to the volatile nature of the crypto markets. We have seen cases similar to this where promises have been made and immediately broken so please stay away. Bitcoin Millionaire Pro Review Conclusions – BLACKLISTED! Trading Bitcoins is definitely a highly lucrative way to earn money, but this does not mean every investment opportunity is legit. The Bitcoin Millionaire Pro SCAM is clearly a trap and get-rich-quick scheme. The narrative is recycled from previous scams and there is no viable way for you to generate money. In short, keep your distance and seek alternative investment channels.